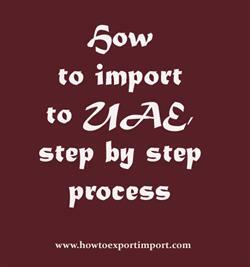 This post explains about step by step procedures that need to be finished with UAE government authority for importation to UAE. How to import to UAE? What are the import procedures in UAE to move goods? Explain about import registration process, cargo movement to UAE from overseas countries, Import delivery process in UAE etc. The United Arab Emirates, simply called the Emirates is a federal absolute monarchy sovereign state. The country is a federation of seven emirates; they are Abu Dhabi (which serves as the capital), Ajman, Dubai, Fujairah, Ras al-Khaimah, Sharjah and Umm al-Quwain. Although most of the process for import and export are similar, each emirate may have their own rules and regulations to import to respective emirate and export from such province. Licensing is important to allow you to be an importer/exporter. It includes having a valid trade license issued by a UAE license issuing authority and being registered with the Customs department. Trade license should obtain from the Economic department from respective Emirates. United Arab Emirates Federal Customs Authority (FCA) is the official customs authority of Emirates that regulates customs operation in UAE. This post explains about different phases in import process that every importer needs to go through in UAE. How to import to ABU DHABI ? Formalities for import to DUBAI. Procedures to import to JEBEL ALI . Need to import to FUJAIRAH . Explain to import to KHORFAKKAN. Information to import to PORT RASHID. Step by step process to import to ABU DHABI . Methods to import to DUBAI. Guidelines to import to JEBEL ALI Please guide to import to FUJAIRAH . Help to import to. Procedures required to import to KHORFAKKAN. Requirements to import to DHOR AL FAKKAN. Clarifications to import to FUJAIRAH . How can I import to DUBAI. What should I do to import to ABU DHABI .